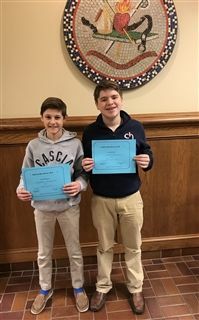 Congratulations to 6th grader, Matthew Kendrick (left), and 8th grader, Josh Glasgow, for their stellar performance in the Cascia Hall Spelling Bee on January 23, 2019. Matthew is the school champion and Josh is the runner-up. Both boys will represent Cascia Hall at the Diocesan Spelling Bee on March 26. Great job and good luck!